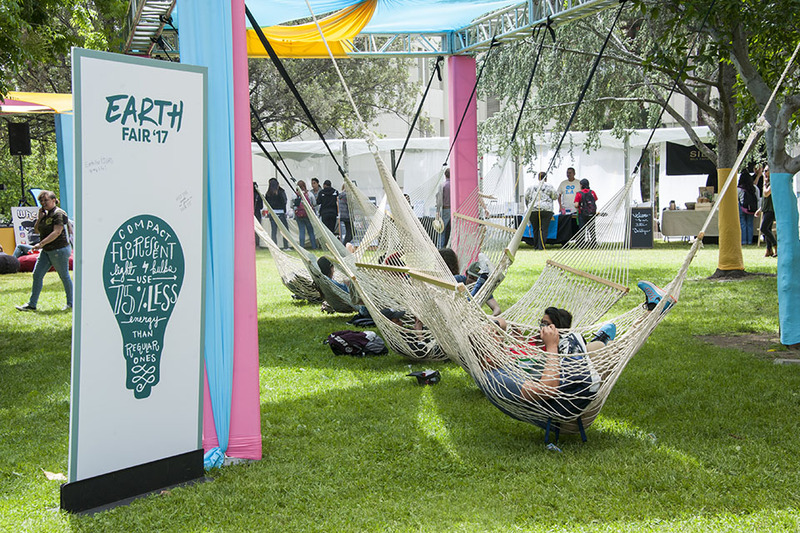 Community members and students were able to enjoy putting their feet up to enjoy the live music and lounge in hammocks during the 2017 Earth Fair. Photo by Luis Garcia. 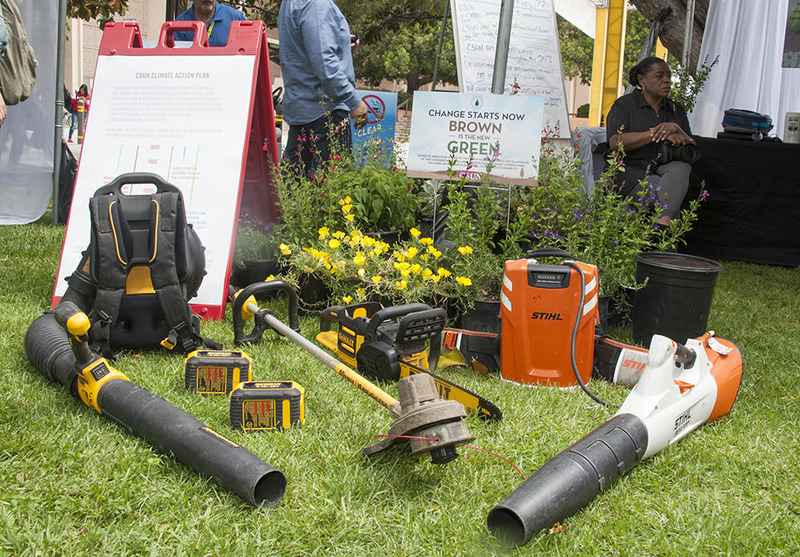 The Physical Plant Management displayed some of their new eco-friendly landscaping tools at the Earth Fair. Photo by Luis Garcia. Students lounging on large bean bag chairs enjoying the live performance of Whesli, one of several live music acts who played during the Earth Fair on April 13. Photo by Luis Garcia. 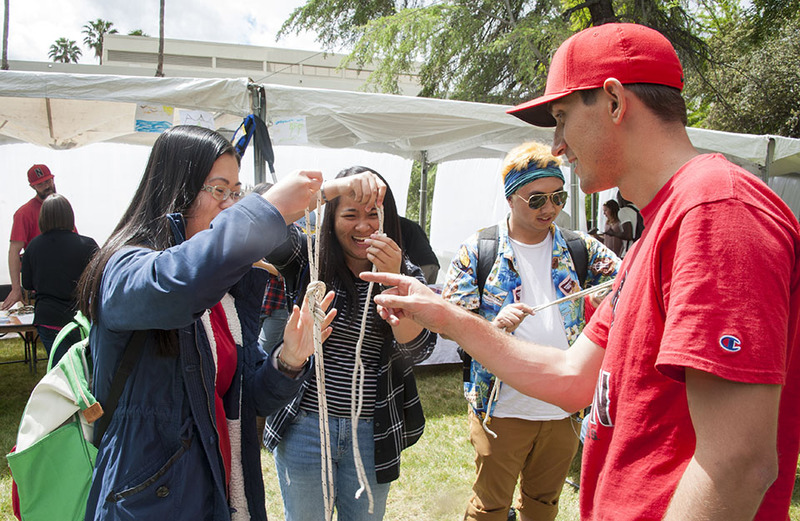 Jennifer Tran (Chemistry), Trang Nguyen (Biotech) and Keith Anthony Gravador (English) learn how to tie different rope knots from Chris Whitesides, CSUN Aquatic Center manager, during one of the activities at the Earth Fair. Photo by Luis Garcia. Xavier Fierro, an anthropology major, signs one of many posters with an inspirational quote about being sustainable. A handful of posters could be seen around the fair filled to the edges with quotes and phrases from students and community members who attended the event. Photo by Luis Garcia. Taleen Gharibian, a marine biology major, explains the benefits of understanding your healthy choices for various seafoods and the effects destructive fishing and farming practices can have on the types of seafood we consume. Gharibian explains to fair attendees what each sea creature in the touch tank is and how they are affected by fishing practices at the Monterey Bay Aquarium Seafood Watch booth at the Earth Fair. Photo by Luis Garcia. Students check out the different types and benefits of doTERRA natural essential oil supplements. Photo by Luis Garcia. 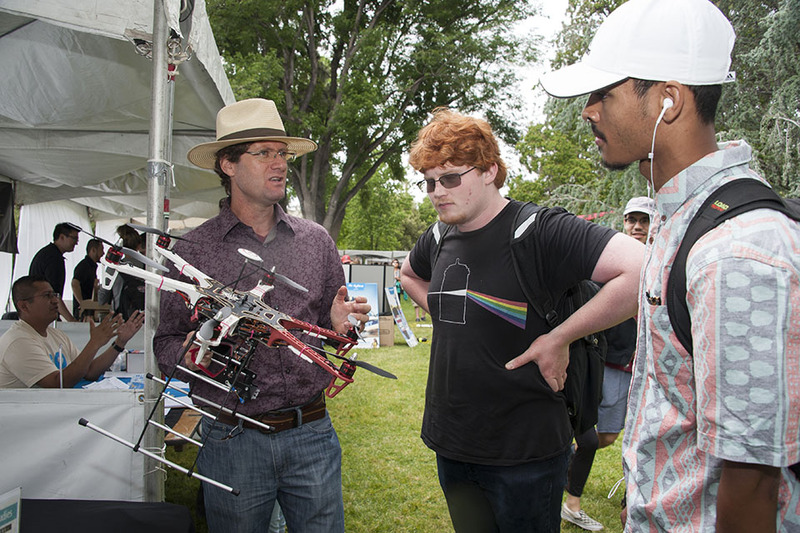 Geography Professor Mario Giraldo explains to students Aydan Scott (Geography) and Akram Mahmoud (Mechanical Engineering) how the sustainability and geography departments are utilizing drones to conduct environmental mapping on and around campus. Photo by Luis Garcia. 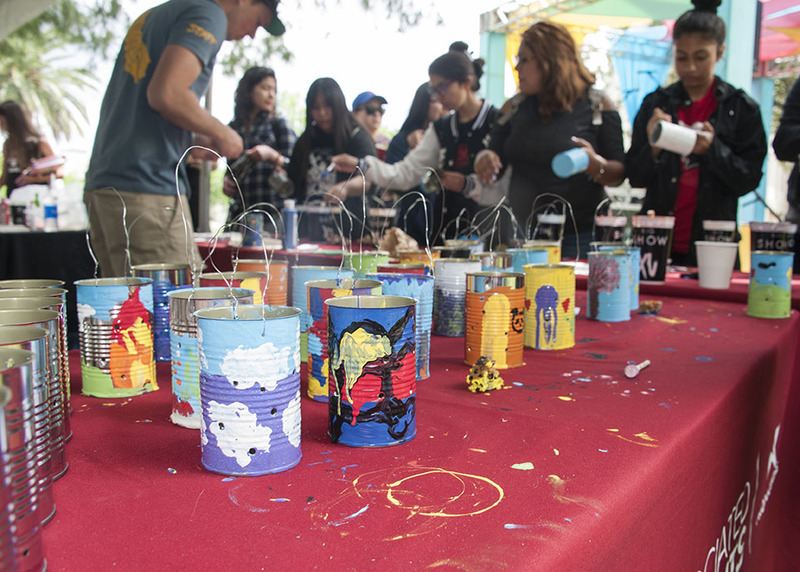 Fair attendees were able to decorate lanterns made from recycled cans at the Associated Students Productions table. Photo by Luis Garcia. 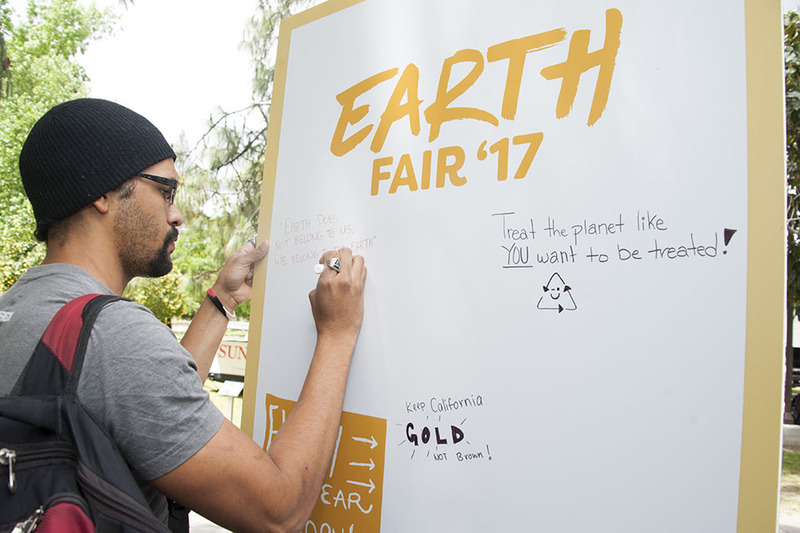 Students and community members of all ages came together on Bayramian Lawn during California State University, Northridge’s Earth Fair. 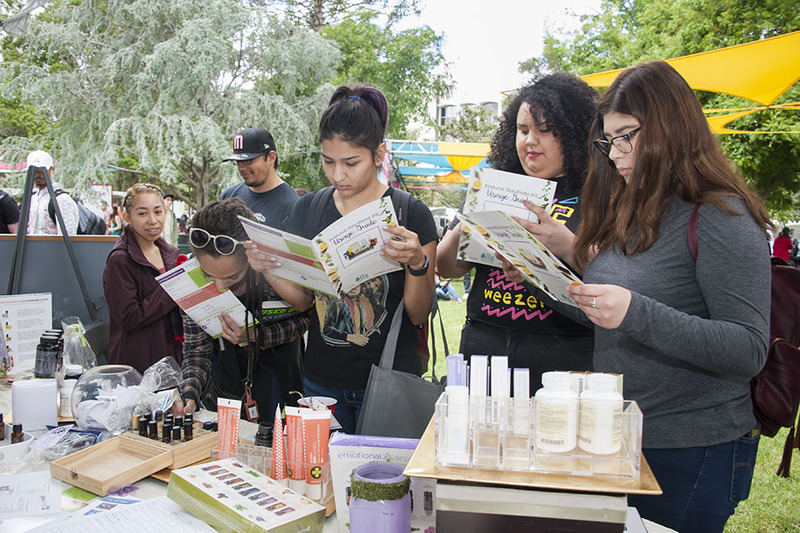 The Earth Fair, hosted by Associated Students (AS) Productions, was free to attendees. The event aimed to bring awareness of how to live sustainably and help the environment to the student population by combining art, music, education and sustainable initiatives. Paczkowski said this year focused on climate change as well as transportation, waste, water, energy and food. Encompassing a majority of the lawn were booths where vendors from on and off campus such as CSUN’s Institute for Sustainability, Monterey Bay Aquarium Seafood Watch, CSUN Outdoor Adventures among many others presented activities for fair attendees to play while trying samples, collecting free items and learning different ways to live sustainably. 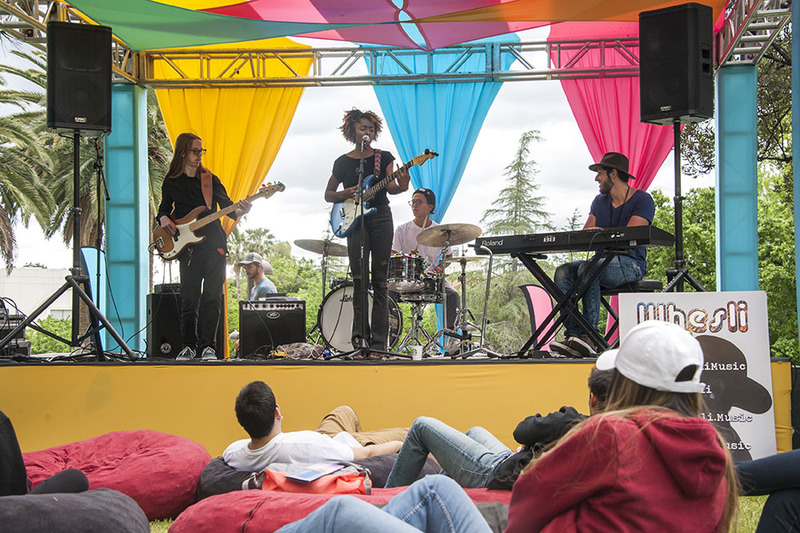 There were hammocks strung up and large beanbag chairs laid out in front of the stage for people to lounge on while enjoying live music from the bands playing throughout the day. 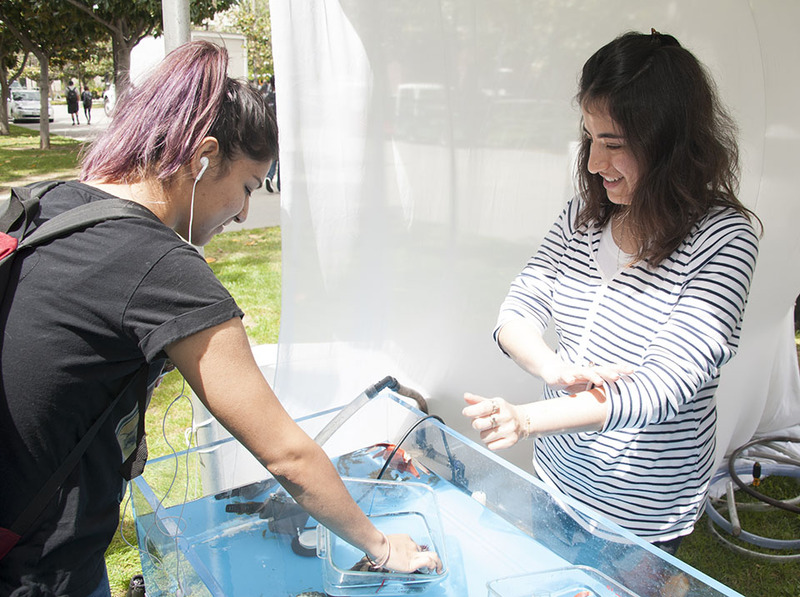 While she enjoyed the live music, Sienna Morales, a third-year marine biology major, said she liked that CSUN had an event like this because she went to a high school that showed a lot of interest in the environment. David Contreras, a sociology and Chicano/a Studies major, was passing by with his little sister when he decided to check out the festivities and ended up at the CSUN Aquatic Center’s painting table. Students and community members were also given the opportunity to attend two separate speaker series located across campus in the University Student Union’s (USU) Northridge Center. The first event, called Rain: A History for Stormy Times, was presented by Cynthia Barnett, an award-winning journalist. The event highlighted the history of our connection to the climate, bringing it together under the idea of climate change and nature as truth. SILA and the Gatekeepers of the Arctic: A Feature Documentary Film was the second event. Director and producer Corina Gamma presented the film, which highlighted the impact of global warming on the once-thriving culture of the Arctic Inuit people. Alexis Ramos, an undecided exploratory major who initially attended the fair to listen to the student speakers, said she wanted to see what else the fair had to offer. Austin Ysais, program coordinator for AS Productions, said he believes the Earth Fair benefits the campus, students and surrounding community because people are able to learn how they can contribute to sustaining our Earth and the quality of life that we have.